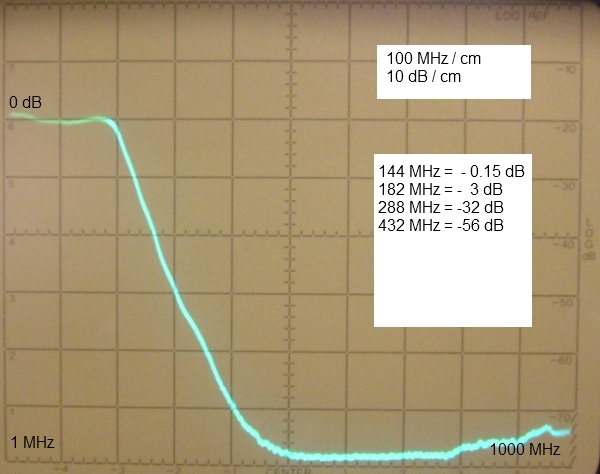 Loss between ports due to the two coax cables is 0.84 dB. 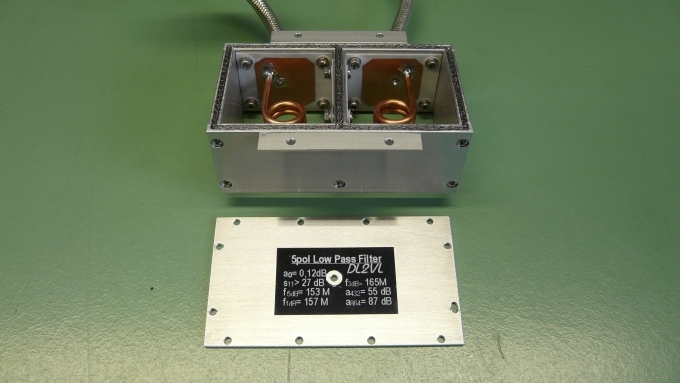 Loss with LPF included is 1.05 dB. 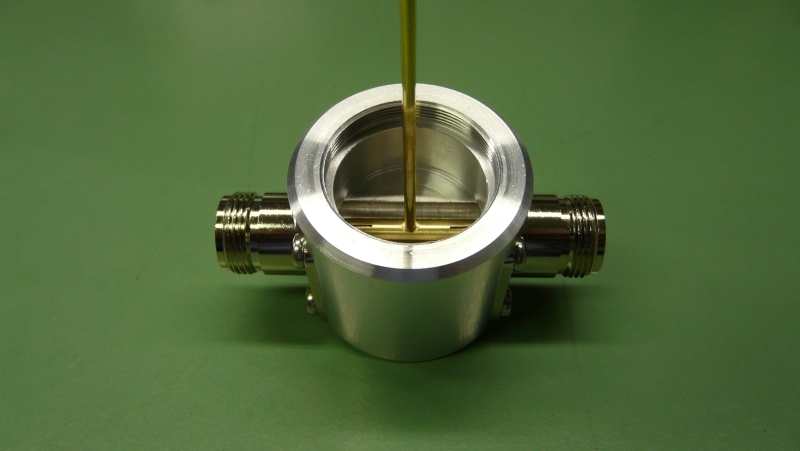 Which leaves 0.21 dB of insertion loss on account of the LPF. 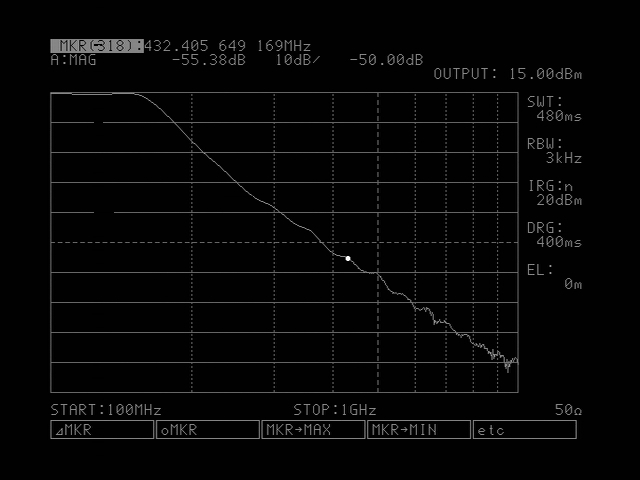 3rd harmonic = 432.3 MHz is damped by > -43 dB. Mission accomplished. 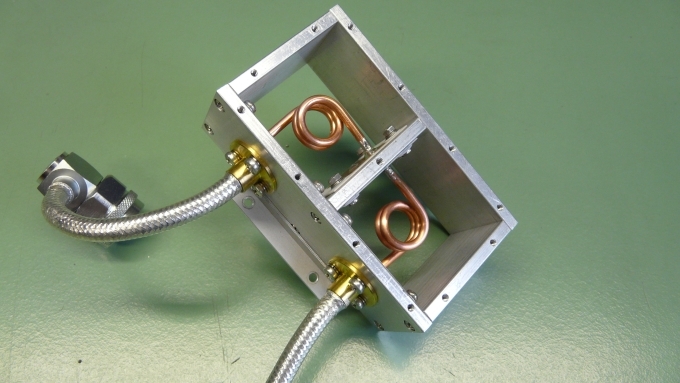 • Losing 0.21 dB on 350 Watts equals a loss of 16.5 Watts which will heat up the box. Drill enough holes into the housing to enable sufficient air ventilation. 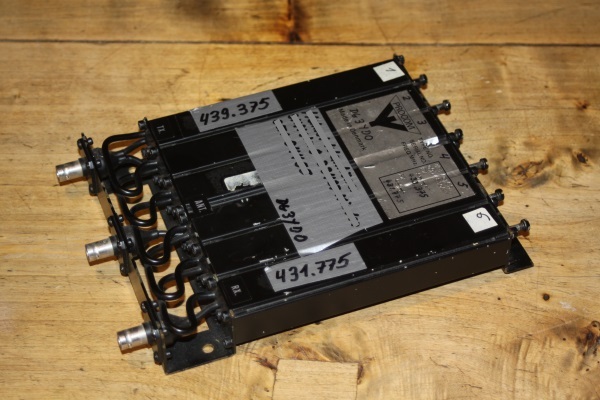 This LPF was designed to fit into a 2m 600W LDMOS PA with a bit of reserve power handling ability. 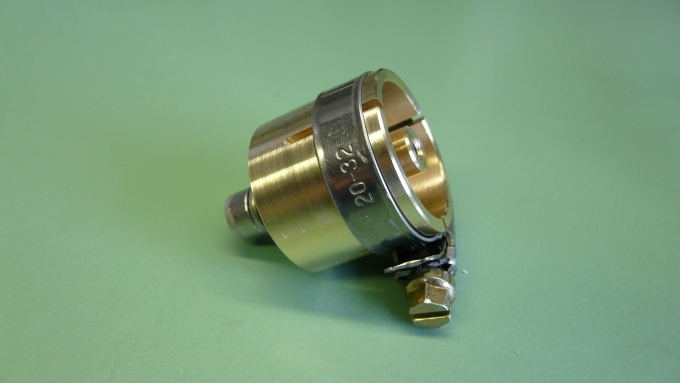 • The short coax pieces are UT-250, 50 ohms PTFE semi ridgid, high power, low loss type. the filter steepness of this real built is increased. 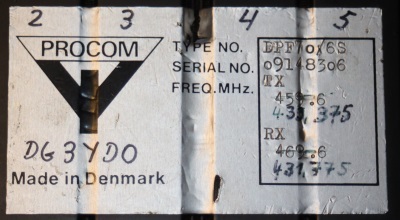 For these measurements an R&S ESVD was used. 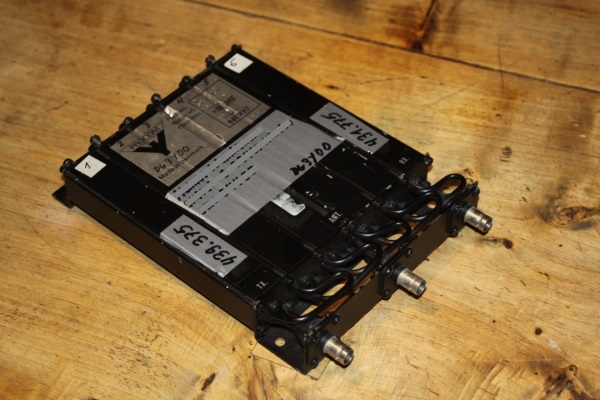 For full VNA plots see below ..
Bodo, DL2FCN describes an LPF that handles the output of his 144 MHz GS35b PA. Driven with 750 W key down for 1 minute the coils get but lukewarm Bodo states. 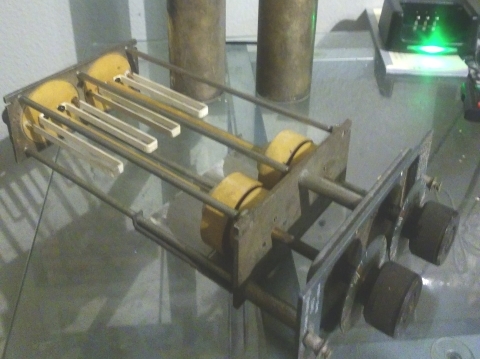 way the 2 capacitors can be produced. They are but aluminium plates, 58 x 67 mm held above the gnd sheet by ordinary Nylon (Delrin) M3 screws. to be used screws are capable is indespensible. 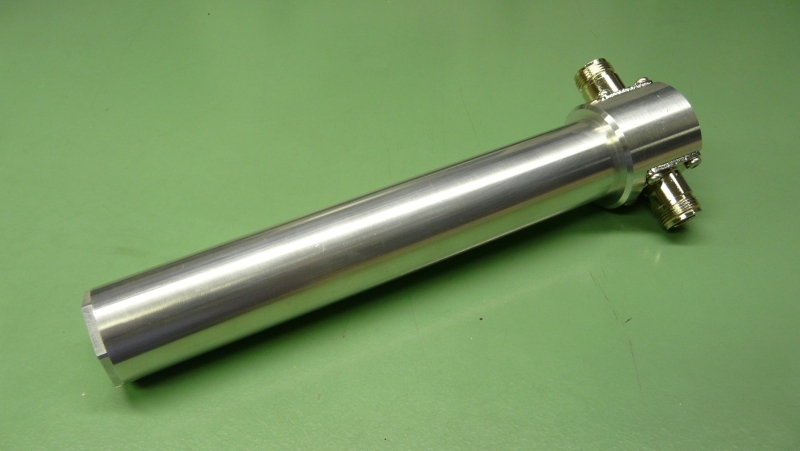 This design has initially been published in Dubus Magazine 4/2007 as "QRO Lowpass Filter for 2m PAs"
Coaxial 432 MHz LPF for about 200 W max. 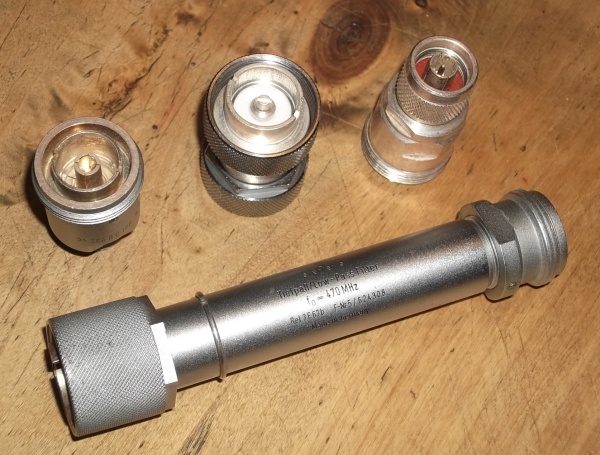 that holds a number of lumped inductances mixed with distributed capacitances. Being designed for 470 MHz it serves the 432 MHz Band well still. 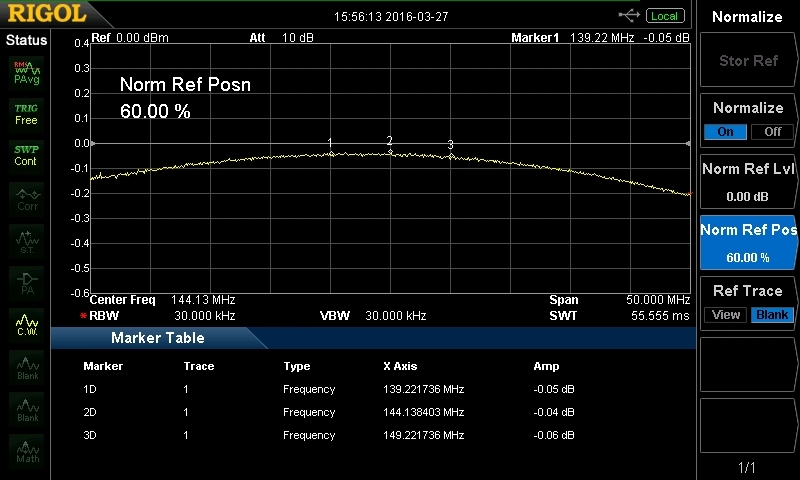 Loss of the coax from VNA to LPF are 1.53 dB on 432 MHz, Loss of LPF included is 1.83 dB. as to be seen on photo. 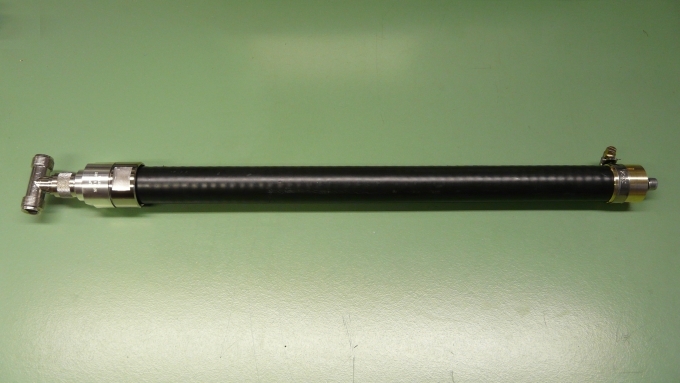 overall dimensions are 297 x 157 x 64 mm. 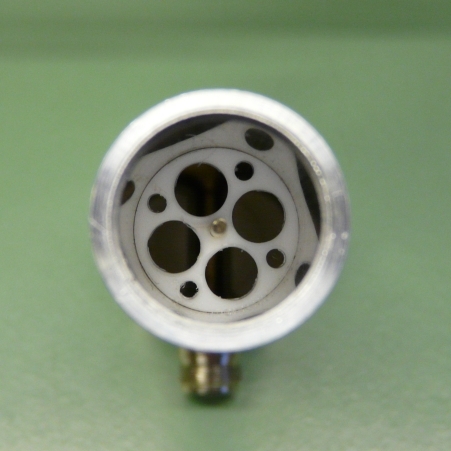 It has 2 x N-female connectors on the backside. the American Ham Radio magazine in 1980. 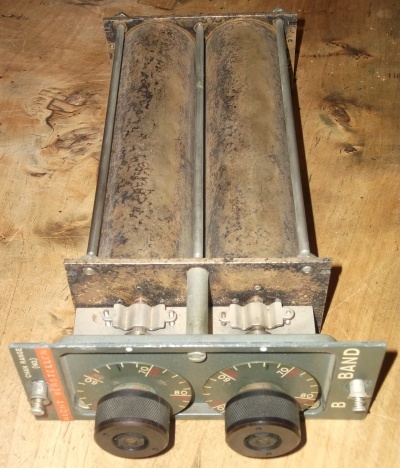 The shown filter is one out of a whole range of similar designed devices for other bands, see the table below. 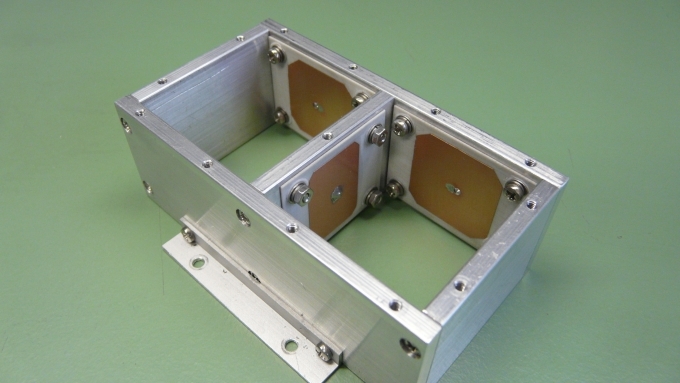 They are also known as 'Rosenkranz-Filter' or 'Bandpass filters for 417/GRC Receivers'. Those filters had been made for a number of commercial bands. scanning the microfilm and e-mailing it to him. 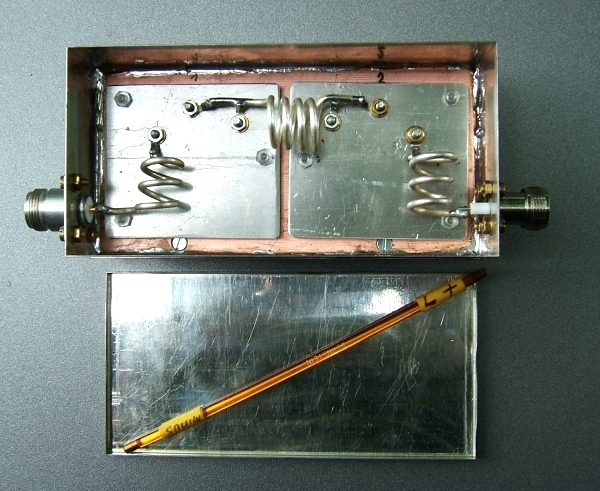 The shown conversions are based on the ideas of W4FXE. 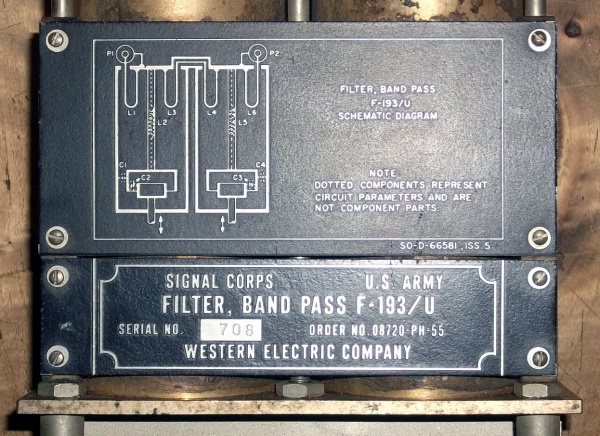 This F-193/U Filter works on 144-146 MHz without any mod. to be spotted. 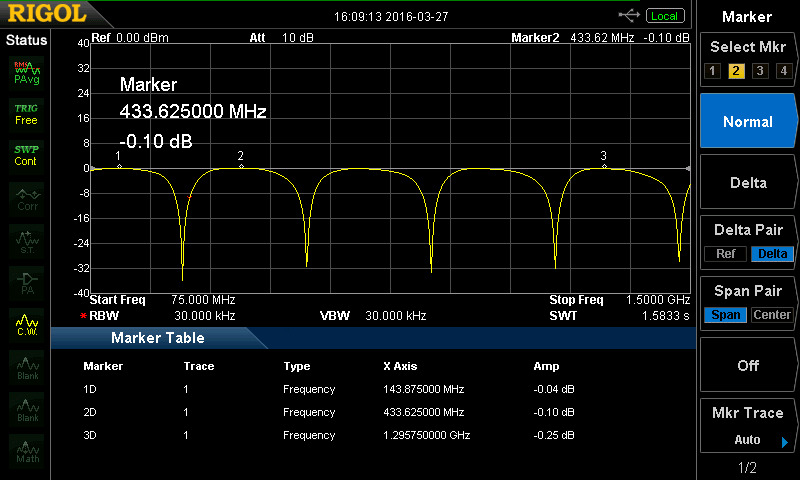 S21, filter curve at 2 m band 144 MHz tuned as narrw as can be. resonance frequency can be tuned. 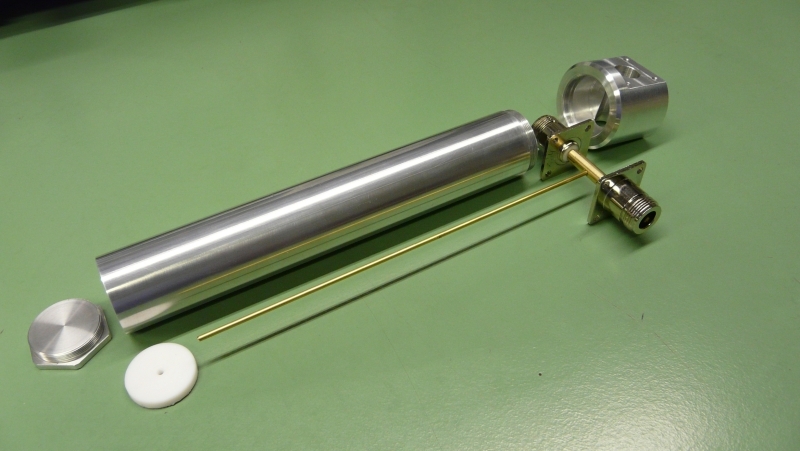 signal on 98 MHz (3.059 m) we use a length of 1/4 λ x V (= 765 mm x V) with an open far end. Jörg, DL2VL: "Die Fa. Dehn verwendet auch dieses Prinzip, der Preis ist aber nicht für das HAM-Budget geeignet. Das Drehteil ist einfach ein "guter" Kurzschluss, der am Ende des Stubs die Seele mit mit dem Mantel verbindet. ist und nicht erst z.B. 350 V auf dem Innenleiter sein müssen, die eine Gaspatrone braucht, um zu zünden." Das wird dann auch als "Offene Stichleitung" bezeichnet. Diese "wirkt wie ein Saugkreis für die Störquelle". 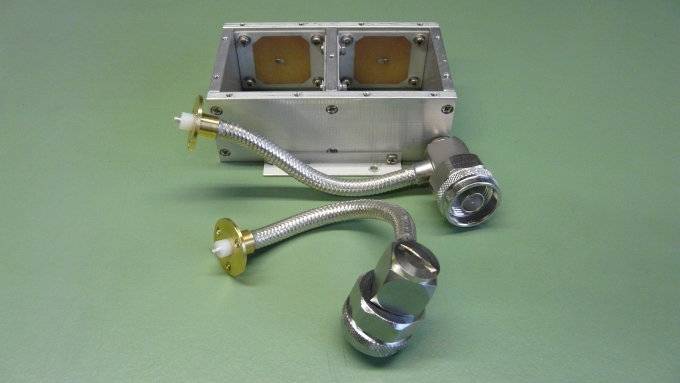 This Notch Filter provides low loss for the 144 MHz pass band and notches 432 and 1296 MHz. 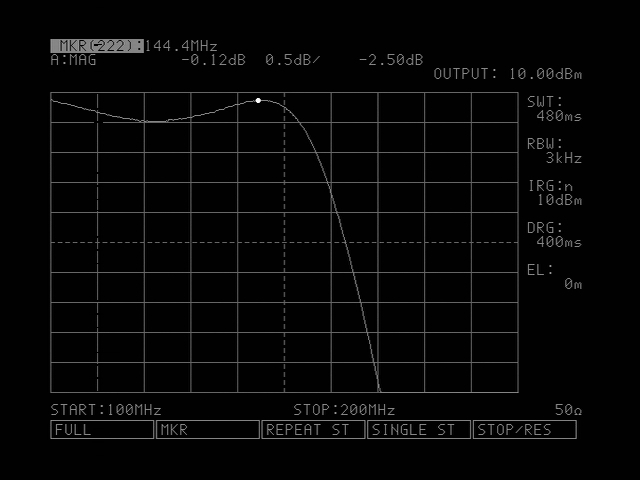 With a Return Loss of 21 dB equaling a VSWR < 1.18 this Notch Filter is suitable for TXing. 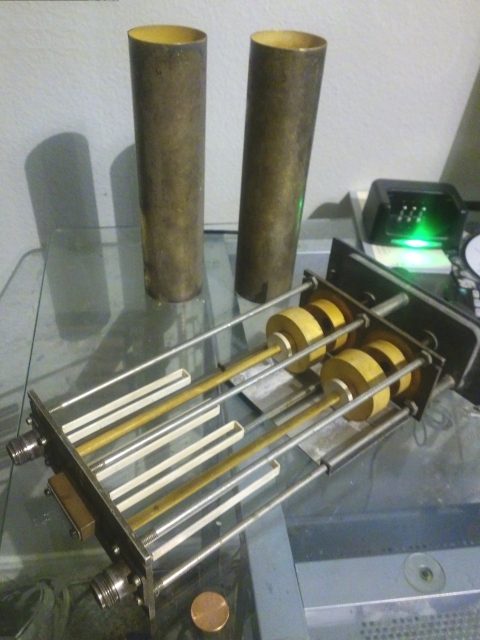 make, and (b) least of impedance interstices. DE: Kerbfilter, filtert im Gegensatz zu Hochpass- oder Tiefpassfiltern Frequenzen in einem engen Frequenzband aus. 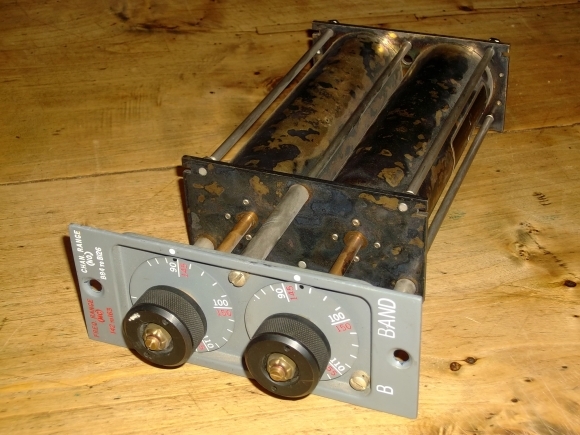 This Duplexer shall serve for a 70 cm band repeater. 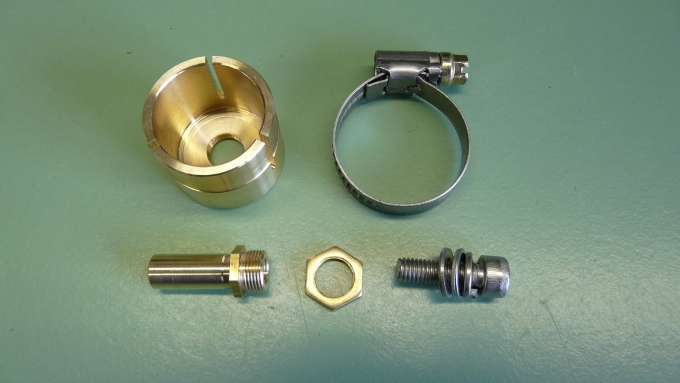 It has BNC plugs and M5 screws with counter nuts for tuning.